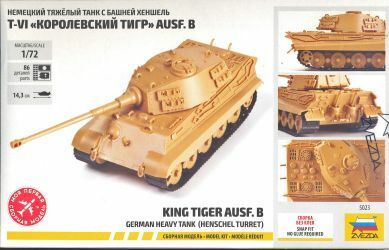 The Tiger Ausf.B doesn't really need an introduction and Zvezda agrees as nothing of the sort is given in the instructions. 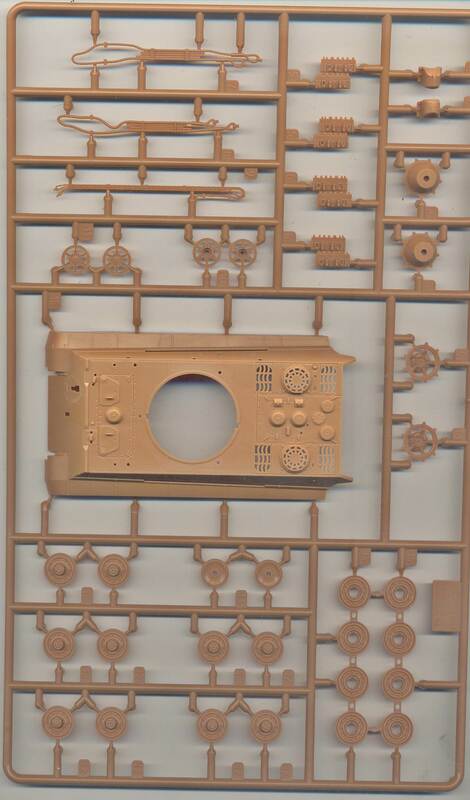 As this is my first encounter with a "snap fit" kit, my first Zvezda armor kit and as I have been tasked to actually build it, I'll start with a quick peek inside the (side-opening) box so I can start removing parts from the sprues as soon as possible. 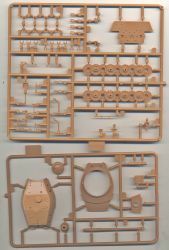 The main sprue with upper hull and suspension. Detail is crisp, but those engine vents are clamoring for mesh that is not included in the kit. 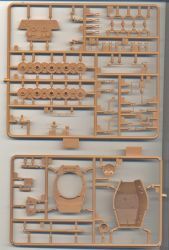 Top: Rest of the suspension, rear hull and sundry bits. 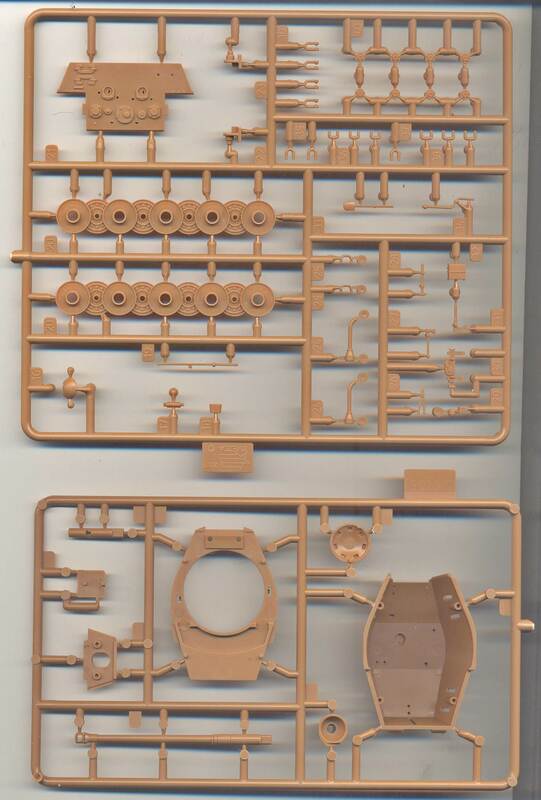 The back rows of the interleaved suspension are pre-assembled promising a speedy and well-aligned assembly. 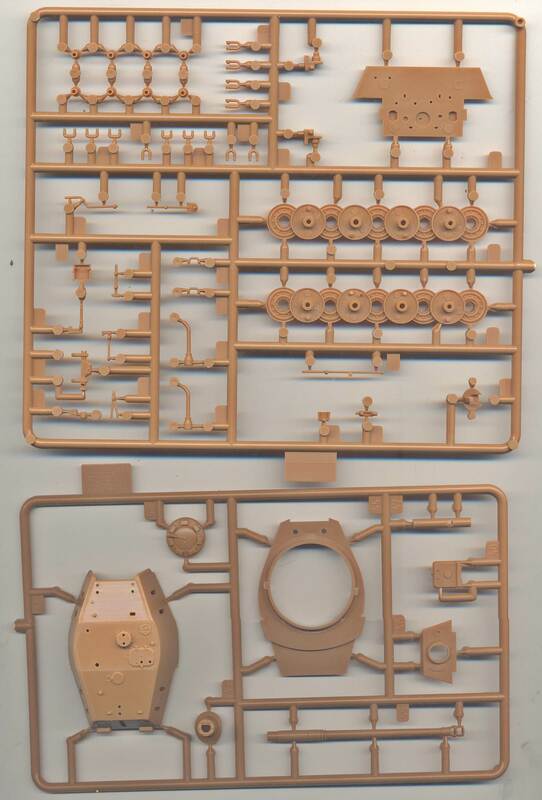 Bottom: turret parts, indicating a possible future release of a "Porsche turret". The tiny decal sheet for one vehicle. The numerals are crisp, but the Balkenkreuze are very slightly out of register; actually enough out of register to bother me. 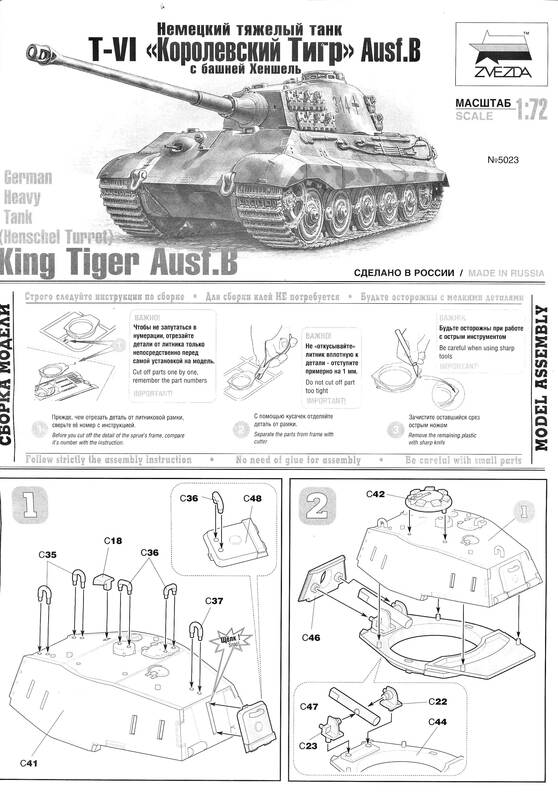 The instructions make you start with the turret. Being a subassembly it can be built in parallel, or whenever it suits your fancy. There is little to comment here. The detail is actually quite nice, with well rendered welding seams, even though the hand grips are vastly overscale (but sturdy enough for rough handling). Most manufacturers would give us a finer rendition of those grips, but would have them closed; Zvezda's are hollowed out. I actually prefer Zvezda's approach, because it will be much simpler to replace the plastic parts with thinner metallic wire, as the holes to accept them are already drilled out. Something to point out here is that those hand holds (e.g. parts C35) are not symmetrical and you need to take care of their correct orientation. Another limitation of the molding process used by Zvezda are the closed hatches and closed commander's periscopes. The snapfit nature of the kit also makes it easy to install the gun so that it can still be elevated after construction. Actually, the only area where I felt that some glue was required was with the front plate of the turret (part C46), because otherwise a gap would remain around that part. While the instructions ask you to install the barrel much later in the sequence, I installed it right away and hollowed out the business end. I did leave off the spare tracks until after the turret was painted. The construction of the suspension was a singular experience. First of all, I must say that I like the concept of single piece hard plastic tracks that can be bent around the suspension. Unfortunately, Zvezda got a few things wrong. 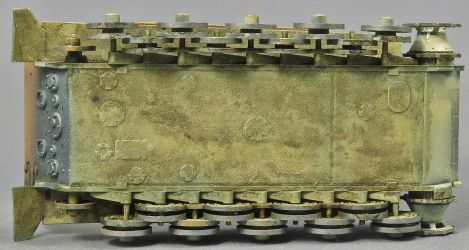 The tracks are attached to the roadwheels with small and well hidden pegs on the roadwheels and eyes on the tracks. In step 5 half of the eyes are to be fixed between parts C30 and C14. 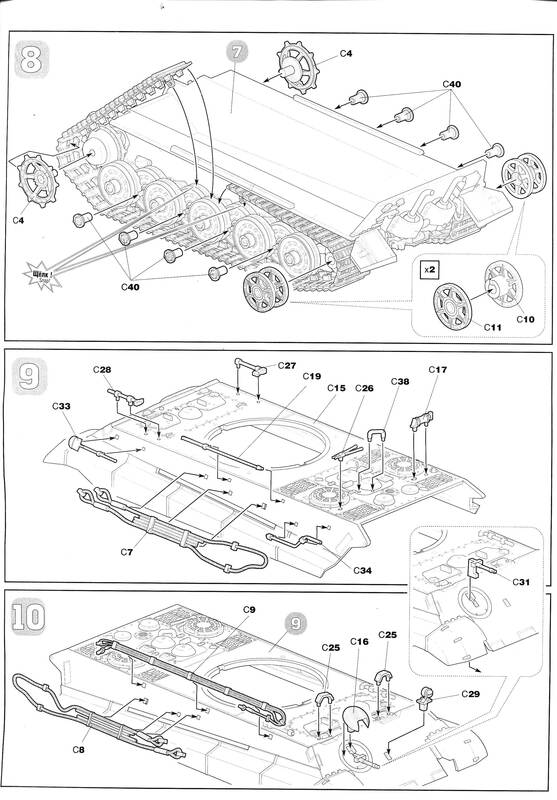 Only in step 8 are the other eyes to be fixed, which is no longer possible, because the road wheels are already assembled. 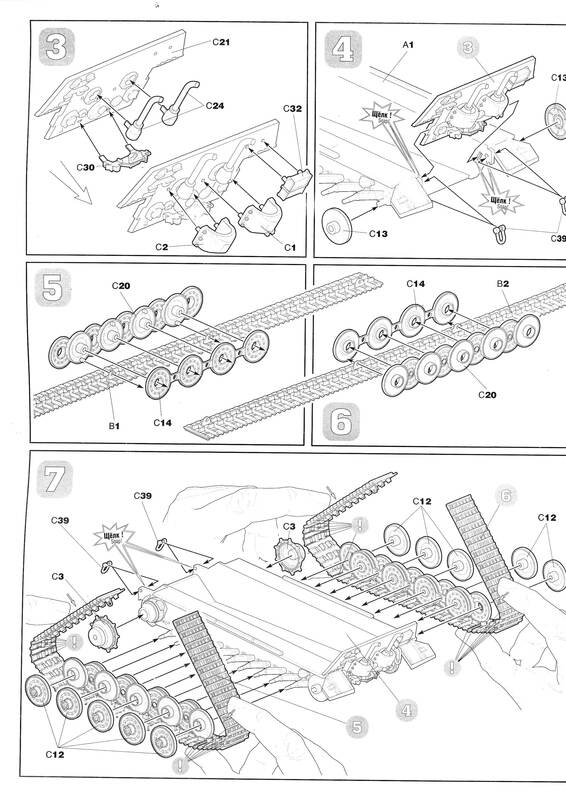 The only solution here is to wrap the tracks around the roadwheels completely at step 5. 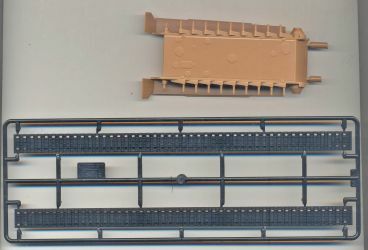 A second good reason to do this is that there is no way you will be able to wrap the tracks around the roadwheels once the latter are attached to the lower hull because the bottom of the sponsons are in the way. Unfortunately, if you attach the tracks to the central roadwheels, it will become difficult to add the drive sprocket and idler afterwards. You also need to take care that the two halves of the drive sprocket are perfectly aligned; as there are no locating pegs. It's best to use glue on them, as they might move a bit during handling which will make it impossible to get the tracks to fit. 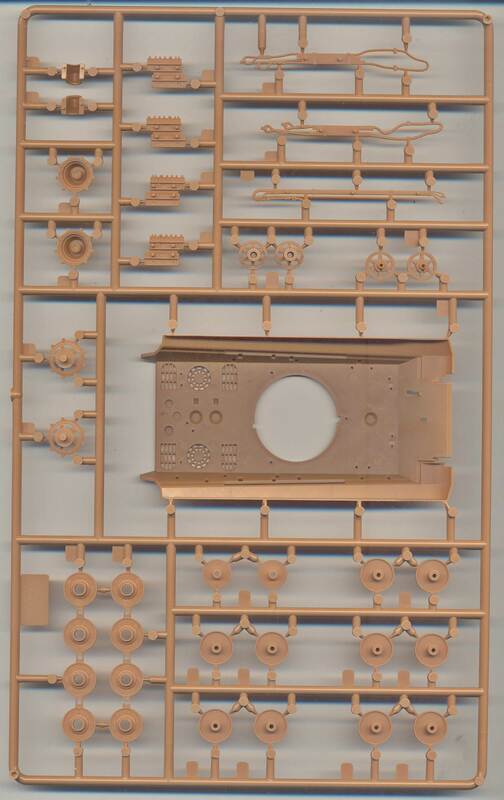 Fortunately, no glue is required for most parts, so you can disassemble the parts and try again. After a few tries I ended up with the following building sequence, which worked. Suspension sequence 1: partially assembling roadwheels. Suspension sequence 2: adding tracks using pegs and eyes on the bottom. Suspension sequence 3: adding drive sprocket and idler. Suspension sequence 4: closing tracks using eyes on top and adding part of the roadwheels on the insides. Note that this will result in roadwheels that are not in the right position with respect to the idler and drive sprocket. Suspension sequence 5: finished tracks (right side). You can already tell that the overall length is overdone, with the first roadwheel too far to the rear with respect to the drive sprocket and the last roadwheel too close to the idler. Suspension sequence 6: the closure of the tracks is ok.
At first I was quite happy, as even without glue the fit was very good and the point where the ends of the tracks met gave a nice joint that was small and would be hidden by the fenders anyway. Ending up with a complete track assembly allowed me to paint the suspension and lower hull separately. It took me a while to realize that this was not of my doing. The axles of all the elements of the suspension are cast integrally with the lower hull and looking at the pictures of the lower hull on the backside of the box and of photos of real vehicles, it is clear that the staggering is overdone. 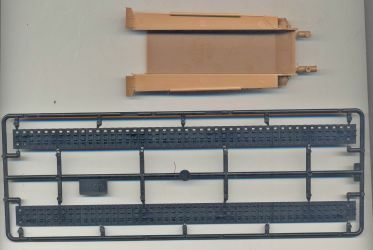 As there is only one way to install the tracks due to the fixation pegs, it was clear that, once more, I was innocent. Suspension sequence 7: attaching the tracks, roadwheels et al. to the hull. 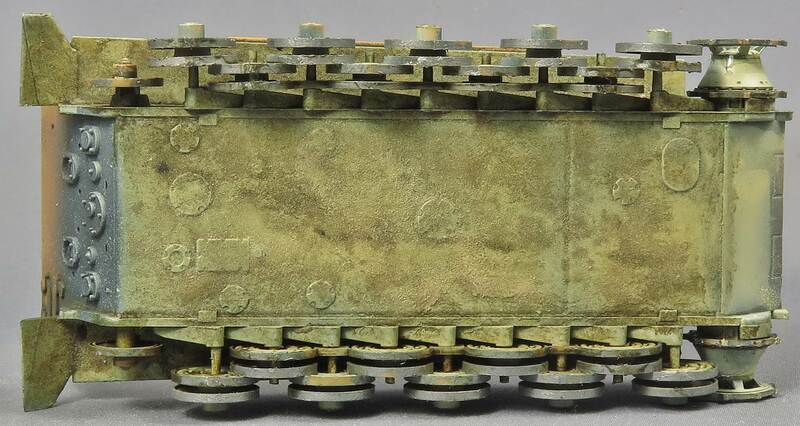 The drive sprockets moves too close to the roadwheels and the tracks are too long. Note the distance between the idler and the last roadwheel: too much on the left; too little on the right. Suspension sequence 8: tracks removed again. There is only one way the roadwheels, drive sprocket et al. can fit to the hull and their relative position is not correct. Suspension sequence 9: roadwheels severed from axles and positioned backwards by a millimeter (on the left). On the right they are moved forwards about half a millimeter. Compare with suspension sequence 7. Moving the whole of the suspension to the rear on the left side and to the front on the right might be an option when done at an early stage, but I limited myself to severing the axles and moving the roadwheels without altering the suspension arms. The axles won't conform to the suspension arms anymore in this way, but this is the lesser of two evils in my opinion as you need to turn the model upside down (or look closely underneath), to notice it, while the relative position of the roadwheels really throws off the look of the vehicle if left unaltered. I also removed the locating eyes of the tracks and shortened them by one link. Gluing them to the repositioned suspension resulted in a result that I could live with. If I had to do it over all again, I would install the drive sprokcet and idler first, then assemble the roadwheels and attach them to the hull. At that point I would, again, sever the axles and reposition the roadwheels. Once this is done, I would shorten the tracks by a single link, and remove all locating eyes. Wrapping them around the suspension and gluing them in position wouldn't be much of a problem. 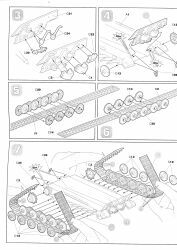 Assembling the lower and upper hull is just a matter of clicking the parts together. Unfortunately, Zvezda didn't use the same system as they did on the Panther. 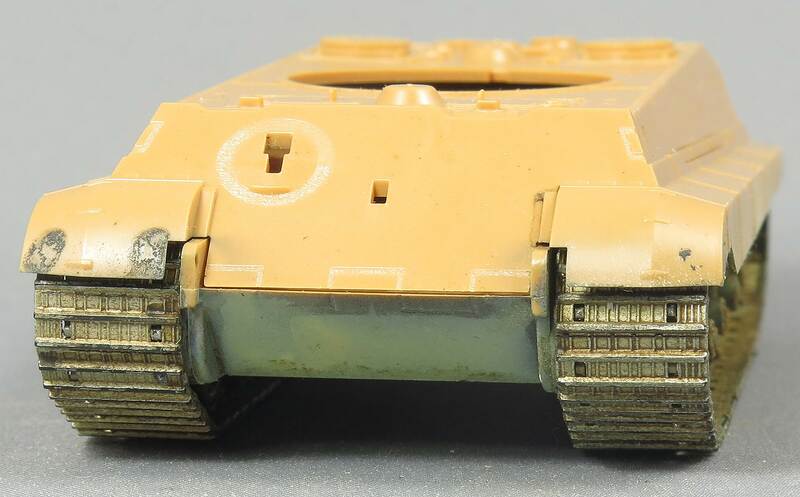 In this kit you get a very visible joint in one of the worst of places: the side skirts. If the large tabs on the lower hull would have fitted just above the side skirts, the prominent joint could just be sanded smooth. If they had used multiple tabs, which kept clear of the ridges on the side skirts, the area could have just been sanded smooth. Being on the side skirts and overlapping those ridges meant some very delicate sanding and filling (or replacing the fenders altogether). I ended up sanding the side skirts smooth and re-creating the ridges with stretched sprue. A lot of work for a snaptight kit. Upper and lower hull joined. Notice the ugly joint in the middle of the side skirts. Also notice the new position of the roadwheels. Side skirts after filling, sanding and restoring the details. The armored covers for the exhausts are foolproof, with pegs engineered in a way that don't allow mistakes. The same can be said for the tools. The fit of the hull is tight, but the extreme nose needs a bit of glue to avoid a gap. Note that the plastic is very soft and is easily eaten away by standard modeling glue. As the kit is meant to be simple, there is no PE. Sadly the openings in the round ventilator covers on the engine deck are rather badly done. A small PE set would really be very welcome here. I blanked off the inside of the engine vents, to avoid a complete see-through effect. The tow ropes need a little bit of glue to stay close to the hull. A few extra pegs would have avoided this. As is the case on the turret, the handgrips are vastly overscale. 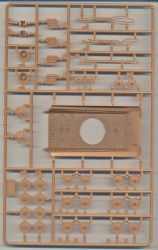 An antenna was added from stretched sprue on the right of the engine deck. The nose needs some glue to avoid a gap. 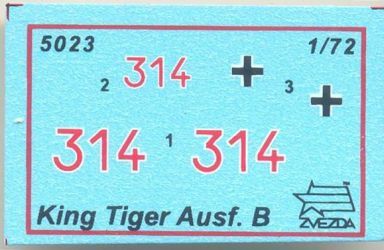 The markings in the decal sheet are for a vehicle of the third company of schwere Panzer Abteilung 503, number "314" to be more exact. Before we go into detail, a bit of history. 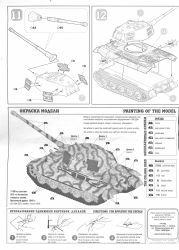 According to , s.Pz.Abt.503 got its first tanks in 1942 (Tiger I and Panzer III Ausf.N). 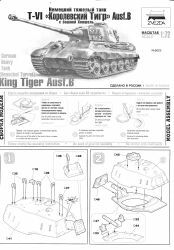 The first 12 Tiger II arrived in June 1944 and were given to I./s.Pz.Abt.503. Except one, they all had the "Porsche" turret. At the end of July 1944, III./s.Pz.Abt.503 also got 14 Tiger II, 12 of which had the "Porsche" turret. The vehicles with "Henschel" turret were 300 and 301. In September 1944 the whole Abteilung was re-equipped with Tiger II while stationed at Paderborn. Some of the tanks had Zimmerit. A movie clip of the unit at that time can be found here. In October 1944 the unit was sent to the Eastern front and was one of the key units during the fights in Hungary. On January 4th, 1945, s.Pz.Abt.503 was renamed Pz.Abt. "Feldhernhalle". The Abteilung's insignia (a tiger's head) was only ever carried by some Tiger I, at the beginning of its operational history. It has to be noted that, while the unit was very successful, it also suffered heavy losses during the three years it was in action. Knowing that the nominal strength of the unit was 45 tanks, it is almost unbelievable that it lost a total of 252 tanks. Doing the math, this means that every tank (on average) was replaced at least 4 times. Vehicle 300, for instance, appears in many different forms in wartime pictures. A still from https://www.youtube.com/watch?v=TWfyMKhIgDg, showing tank 314. Zvezda gives decals for "314" of III./s.Pz.Abt.503. There was indeed a vehicle 314 in the Gliederung, but the only pictures I have found are the one above and the well-known pictures of Anneliese. This is in itself somewhat surprising as "314" should have been a vehicle with a Porsche turret when III./s.Pz.Abt.503 got its first Tiger II in July 1944, but the picture above (taken in September 1944) shows 314 to be a vehicle with "Henschel" turret, while "314 Anneliese" is again a vehicle with "Porsche" turret in early 1945. This illustrates well at which rate the unit lost tanks, and it is not impossible that yet another "314" existed. The markings and camouflage pattern in the Zvezda kit don't match "314" at Paderborn: the font of the numerals is different and so is the camouflage pattern. 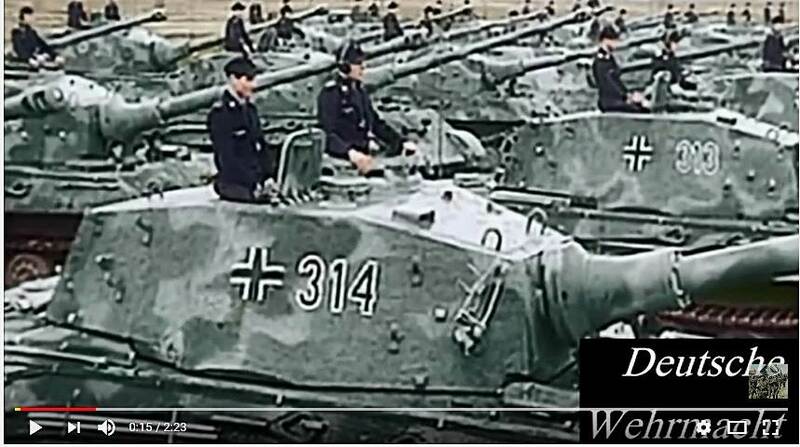 Even if we assume that yet another "314" with "Henschel" turret existed, the markings would probably still be wrong, as the numerals are in red with white outline, while the Abteilung used black on its Tiger IIs. On top of that, the claim in the instructions that this is a vehicle of s.Pz.Abt.503 in 1945 would technically only be correct for the first three days of that fateful year. As I wanted to use the decals that came with the kit for this review, I decided to finish it as a vehicle of s.Pz.Abt.501. I had no picture of "314" with that unit at the time I was building the kit, but the unit used red/white turret numbers with a font close to that on the decal sheet. Typically, with that Abteilung, the numbers were placed underneath the Balkenkreuz. While the decals for "314" went on well, and reacted admirably to softening fluids, the Balkenkreuz was replaced with an item from the spare's box, as the one on the decal sheet was out of register. After I had finished the kit, Timothy Lau showed me a picture of a "314" from s.Pz.Abt.501 which closely resembles my interpretation, except that it carried Zimmerit. I can only hope that this vehicle was at one point replaced with a vehicle that didn't carry Zimmerit. 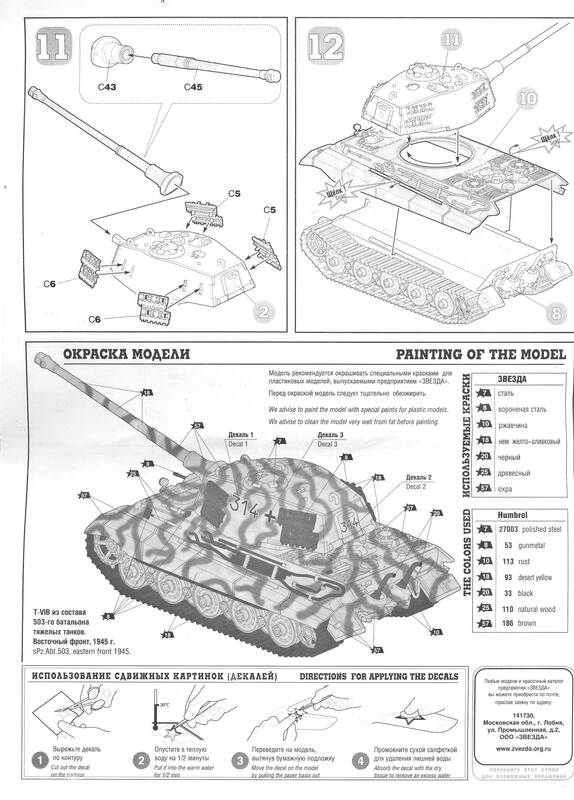 Perhaps the whole issue of Zimmerit, is the reason why Zvezda's instructions want us to believe the vehicle is from s.Pz.Abt.503. 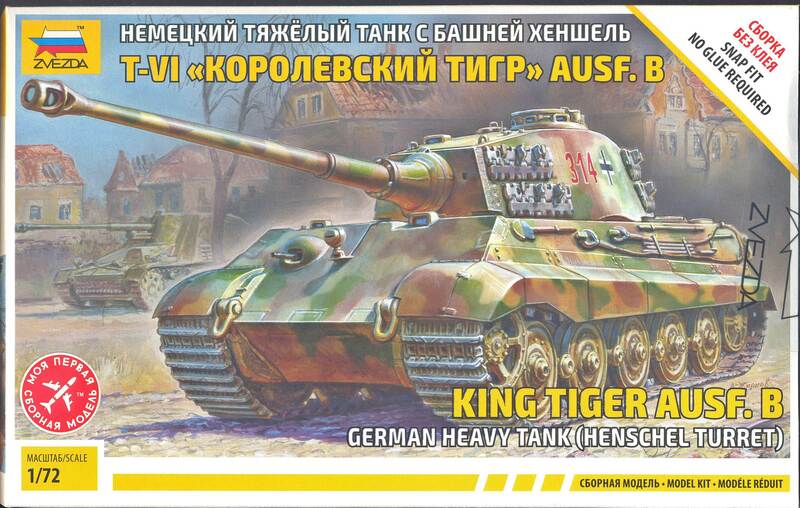 Production of the Tiger Ausf.B (better known as King Tiger) started in January 1944. The first 50 were produced with (what is known as) the "Porsche turret". In June 1944 the "Henschel turret" became available. Note that all Henschel turrets were fitted with the sectional gun barrel and had Pilzen. In red above the kit features. 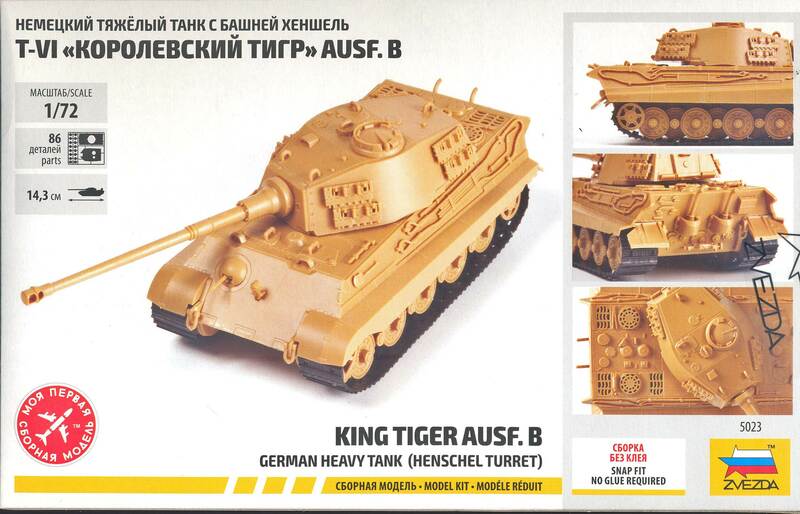 You can clearly see that there is no line that is completely in red, but the kit seems to be most in line with a September 1944 vehicle. As can be seen, the running gear is a mixed bag. The length of the whole of the suspension is ok, but the total length of the roadwheel assembly is slightly too big, so, no matter what you do, the distance between the roadwheels and idler/drive sprocket will always be a bit too small when measured over the axles. The fact that the roadwheels themselves are too small, helps a bit in this respect. In hindsight, I think the suspension on the right side could have been left unaltered. 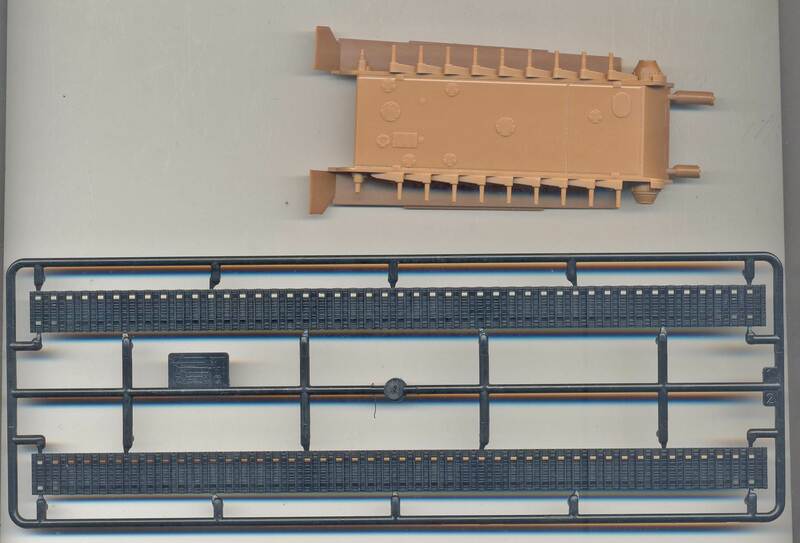 Some other items that might warrant attention with this kit: the sides of the tracks are smooth (no notches, no track pin heads); the track teeth might be just a tad on the short side. 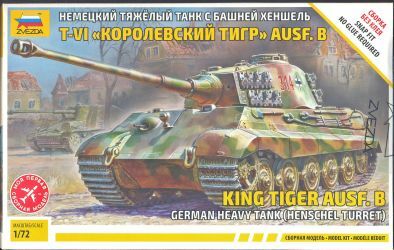 The dimensions only say so much, but it is clear that the kit, in general is over-sized (assuming  is correct), except for the length of the turret. Given that the turret is (approximately) 1/67 in height, 1/71 in width and 1/74 in length creates a visual distortion that is very noticeable when compared to pictures or scale drawings. Compared to pictures, it the turret indeed gives a stunted impression, especially at the rear, where it should go over the engine deck more prominently. Compared to the drawings in , another striking differences are that the periscope for the gunner is too much to the center of the turret. The lack of an AA mount for the commander is also a sad omission. 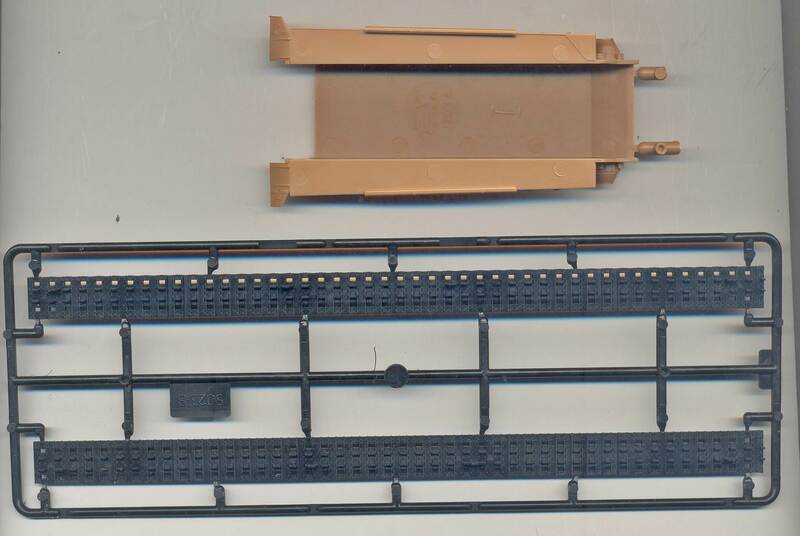 Note that the U-shaped towing brackets could be installed low on the rear hull (as per the instructions) or high on the hull extensions that are almost level with the engine deck.